What goes around doesn't always come around. In the publishing business, one way to say this is that what goes out of print doesn't always come back into print. In many cases, that might not be particularly bad news - you're probably not waiting for that reference manual for 1960s era COBOL programming to reappear. But in some cases, a really useful book will go out of print and - over time - increase in cost to often ridiculous prices on the secondhand market owing to scarcity and demand. All you can do is to watch the prices rise and continue to regret that point at which you passed on the chance to pick up a used copy of Miller Puckette's The Theory and Techniques of Electronic Music or Allan Strange's Electronic Music: Systems, Techniques, and Controls for a less usurious price when you had the chance. What do Vito Acconci, Joseph Beuys, Guillaume Apollinaire, Karel Appel, Antonin Artaud, John Baldessari, Hugo Ball, William S. Burroughs, John Cage, Henri Chopin, Henning Christiansen, William Copley, Jim Dine, Jean Dubuffet, Marcel Duchamp, R. Buckminster Fuller, Allen Ginsberg, Hans Haacke, Richard Hamilton, Allan Kaprow, Martin Kippenberger, Claes Oldenburg, Yoko Ono, Nam June Paik, Tom Philips, Robert Rauschenberg, Jim Rosenquist, Kurt Schwitters, Richard Serra, Robert Smithson, Jean Tinguely, Yoshi Wada, William Wegman and Lawrence Weiner all have in common? Well, yes. They are all artists - well done! But there’s something else they all have in common: their work has something to do with recordings, and - more to the point - with records. Even before the arrival of postmodernism improved the quality of our lives by blurring the boundaries that separated genres and artistic media, there were visual artists out there working in the recorded medium in some form or other in dozens - no, hundreds - of instances. 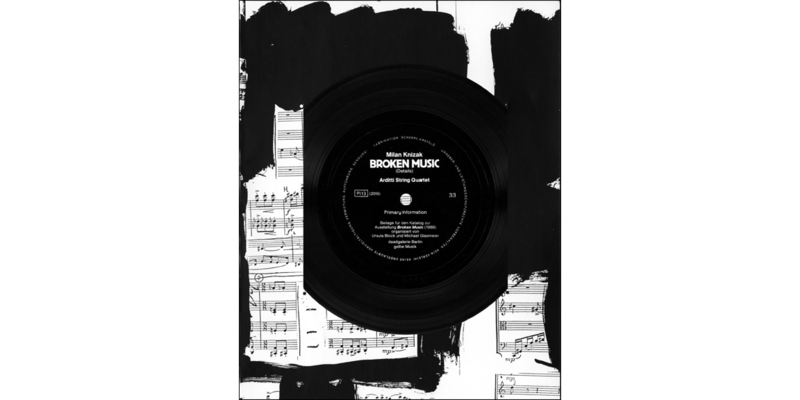 For many years, to single most essential go-to listing/discography of records created by visual artists was a catalog to an exhibition edited by Ursula Block and Michael Glasmeier and originally published in 1989: Broken Music: Artists' Recordworks. The exhibition was originally mounted at the DAAD gallery in Berlin, and later travelled to the Hague and to Grenoble in the early 1990s. 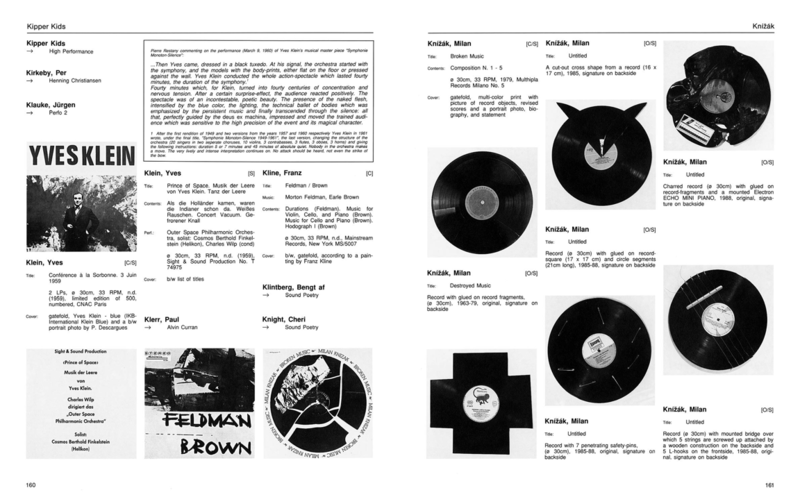 As a sourcebook, it was without peer, focusing on recordings, record-objects, artwork for records, and record installations made by hundreds of artists between World War II and 1989. The book was meticulously researched, lavishly illustrated, and (to my delight) longer on documentation than on theorizing. Of course, it went out of print, and this marvelous art book hybrid of The Whole Earth Catalog and a record-collecting crate-diver's bible shot up on the used market to truly insane prices. I excoriated myself for many a year over not picking up a copy of it back in the day when the exhibition and catalog showed up in one of my favorite Dutch museums (the Haagse Gemeentemuseum) in the early 1990s, and had to make do over the years by regularly seeking a copy out in local public and university libraries. 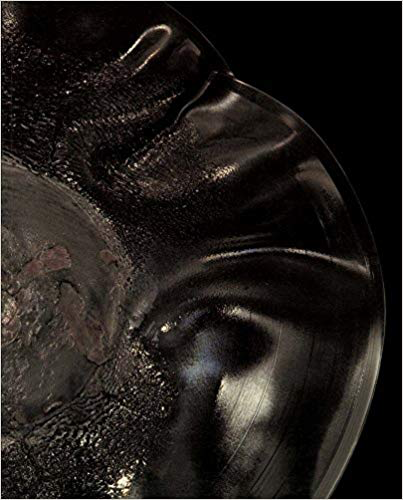 Well, it's back, at very reasonable prices, and back in its original form - a facsimile of the original down to the inclusion of a Flexidisc containing recordings of the work of Milan Knížák, who referred to the collages he made by cutting, breaking, painting and otherwise modifying phonograph records as “Broken Music” and probably provided the title for the exhibition itself. Whenever reissues of a text like this are announced I always wonder whether it’ll be a reissue of the original document or an “updated” version that dispenses with the idea that it’s a re-creation of a specifically dated cultural object. While there's sure space for a volume that brings this listing up to date. I'm happy to report that thumbing through this book is a meeting with an old and trusted friend (and, in your case, perhaps meeting a new friend of yours) rather than an exercise in revisionist history. Some quality time with Broken Records has certainly had me making lists of recordings I cannot easily scarf from the Ubuweb sound archive that caught my eye. I fully expect that this isn't a book that will excite everyone. But I would imagine that some of you will find this an amazing, inspiring, and diverting read. Check it out!